In the development of this topic, the most “extensive” in his work, Bellini can only be compared with Raphael. From time to time he wrote the Virgin on orders of private clients – on small canvases). There is in his legacy and compositions of a small format, where the Madonna is depicted surrounded by saints). Along with similar works, the artist also performed solemn altar images. In such cases, he usually depicted the Virgin Mary on the throne, and around her placed the saints and angels. Surprising endless variety, which he knew how to achieve Bellini in the same story. The expression of Madonna’s face, the pose of the Christ Child, the background – all this changed from painting to painting, and each time the master created a new image, something majestic, something mournful, something pensive and tender. Almost always the Bellini of Our Lady is sad and humble. She holds her child in her arms as if she wants to protect Him from the upcoming torment. But She knows that this is impossible. 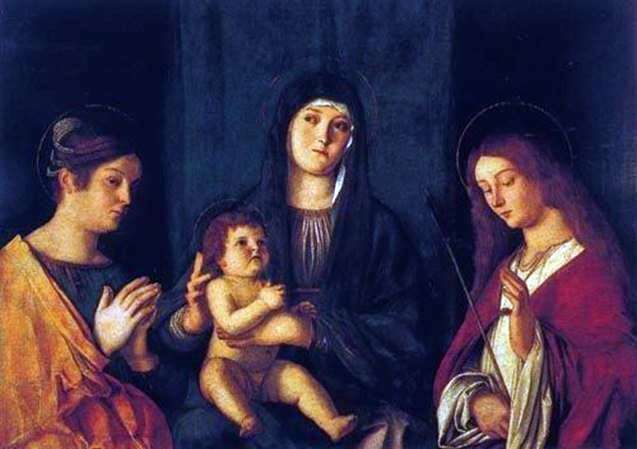 Description and meaning of the painting Madonna with the Child, Saint Catherine and Saint Ursula by Giovanni Bellini.